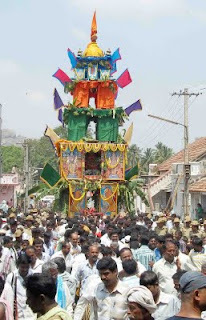 On eve of auspicious Sri Rama Navami Festival, the Chariot Festival of the leading deity of Ramanagaram Town Sri Rama was successfully conducted on 13th April 2011, with all grandeur. 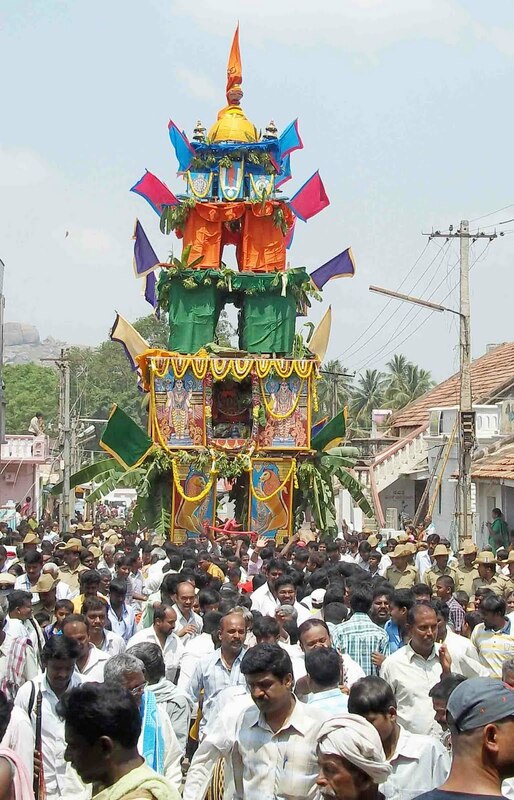 The 50 ft tall chariot with idols of Sri Rama, Seetha Devi, Lakshmana and Hanumantha was pulled by devotees on the Agrahara Main Road, M.G.Road, Main Road and Choultry Street. Thousands of devotees across the district had a glimpse of Lord Sri Rama and offered bananas and “javana” (a kind of leaves) to the lord as devotion. Many individuals and service oriented groups organized “aravantike” across main roads and distributed Butter Milk, Lemon Juice sweetened with Jaggery along with “Kosambari” (mixture of cucumber, moong dal, coconut grating, coriander and chillies) that quenched the thirst and hunger of devotees. The photos here shows the chariot and the "aravantike"organised by R.P.Ramesh, J.Mukundaraj and friends on Choultry Street.